When portfolio companies are restructuring for growth and integrating new acquisitions (each with a unique data ecosystem), synthesizing reliable, timely KPIs can prove frustrating. It demands a dedicated, executive-minded resource with a mastery of pivot tables. Those folks are usually busy with their "day jobs." Moreover, manually exporting point-in-time data from transactional systems (ERP, CRM, etc.) results in an asynchronous translation of information that is subject to multiple points of interpretation as the data is moved and manipulated through the process. The output is often low-fidelity information that produces as many questions as answers. The goal of "data intelligence" is to get the right insights to the right people in a timely manner. Those insights need to support the focus and decisions that make those people successful in their work. 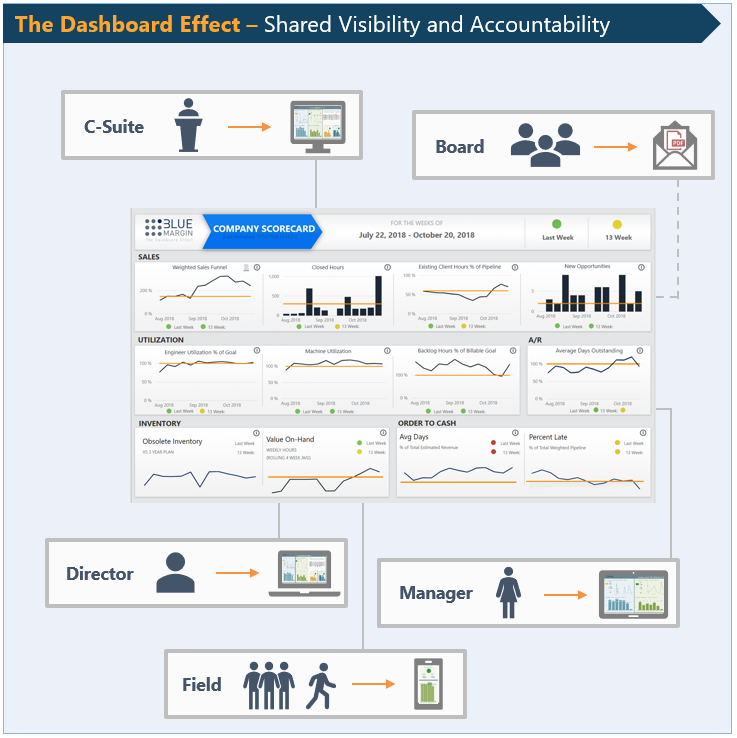 Dashboards (or "scoreboards," "reports," call them what you like) need to be personal and need to "touch the nerve" that spurs change. Information is not the goal. Better execution is, and shared, real-time visibility into the right performance metrics is the most accessible means of operationalizing strategy and transforming companies. Fortunately the process of harnessing data, and rendering it for easy consumption and high-impact is orders of magnitude simpler and more affordable than even 5 years ago. Cloud services, agile BI systems, and integrated tools such as Microsoft's Azure make it easier. Power BI and other leading data intelligence tools shortcut waterfall development, allowing companies to deliver insights early and often, in parallel with building a reliable, scalable data warehouse. Learn how progressive mid-market companies like Elgin Fasteners, Billing Tree, and Nova Biomedical are putting their data to work to produce better outcomes in weeks rather than months. Delivering an accurate, real-time picture of performance, from finance, to sales and operations, is not only the best way align focus at all levels of a company, it demonstrates a mastery of the business to potential buyers and maximizes valuation. To learn the tactics of becoming a data-driven company, download the first two chapters of our book, The Dashboard Effect. Send us your comments and we'll ship you a hard copy of the book from Amazon.